Jeff Moore, owner of Solana Succulents will tell us his tales of succulents. Jeff Moore has owned and operated Solana Succulents in Solana Beach for the past 22 years. Jeff has created many award-winning gardens at the annual San Diego County Fair and Home Shows. 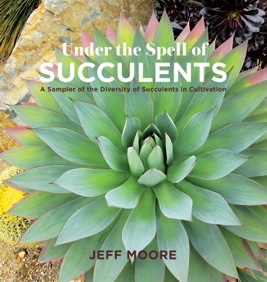 Jeff gained notoriety for his 'undersea' themed succulent gardens, and he will show how he created these gardens, as well as, other unique Southern California succulent landscapes. Winter is aloe season, and Jeff is an aloe collector, so aloes will be highlighted in the talk. Finally, his new book, Under the Spell of Succulents, will be presented. It is a walk-through of succulent plants in cultivation, showing how we engage with our obsession with these unusual plants, including growers, collectors, landscaping, container gardening, and specialty niches such as variegates, crests and caudiciforms. The major succulent groups are highlighted as well. Jeff will also provide an insight into how a first-time author worked his way through the book-making process, and offer a tease into his upcoming book on aloes and agaves. Jeff will be selling and signing his book at the meeting.